We had an eventful week around here. 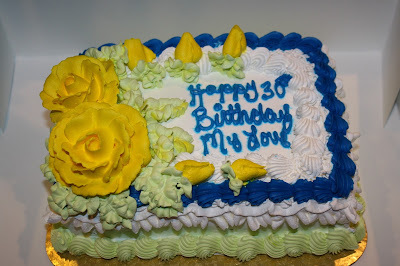 On Wednesday, I turned the big 3-Oh. Dan took the day off of work and we had a low-key day together. We spent time together as a family and later got a babysitter and spent some time alone. We dropped off our Ethiopian art to be framed, checked out some art exhibits at the framing shop, and went out to dinner. Then we can home and had cake with the kids. It was the perfect way to spend my birthday. Dan and I commented that those are some serious flowers! In honor of my 30th birthday, Evie decided to go on a napping strike all week. Evie is normally an amazing napper. We can generally count on her taking a 2-3 hour nap every day. For some reason, she decided she wanted nothing to do with it this week. She was tired - oh she was tired. But she would not sleep. It's one thing when a child skips a nap and is still happy. Sure, you miss that time where you used to do other things, but it happens. This was not the case with Evie. She needs her naps. So when I would get her up after attempting a nap (and I gave it the ol' college try! ), she was grumpy and clingy and having one tantrum after another. The napping strike was not working for anyone, especially her. Being the older and wiser 30 year old that I now am, I just rolled with it. I wish. I really try not to let stuff like this stress me out. I'm journaling the beauty in the moments (on #332 on the way to 1000). I remind myself that there are one billion people living without clean water, so how can I get stressed when my kid's a grumpy mess? We have it good. I need to get over myself. But by the fifth day of it, my patience was running thin and so was my ability to maintain a cheery perspective. Thankfully there's a little something that can melt away the frustrations of a trying day. Some people have a glass of wine, others take a hot bath. I sew. I'm always amazed at how after only a few minutes, my perspective shifts and all feels okay again. A couple months ago, a classmate of Jude's was wearing a shirt with a felt applique. I had never thought of appliqueing with felt but I loved the concept. After doing a little research, I learned that if you add a felt applique to clothing (or anything that will be washed) it has to be either 100% wool or 100% polyester, otherwise it will shrink when washed. Last week, two friends dropped by several bags full of clothes for my kids. We have been so blessed by the generosity of others in that regard. Most of my kids' clothes are hand-me-downs. So I had some new (to us) clean slates in which I could add my wool felt appliques. Initially, I planned to add an applique to this little dress for E.
I had a visual of how it would look, but the visual did not match up to reality. 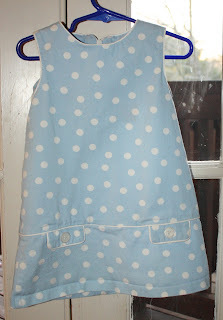 The applique just did not work with the dots. So I added the applique to this shirt for Indi, and I think it came together nicely. 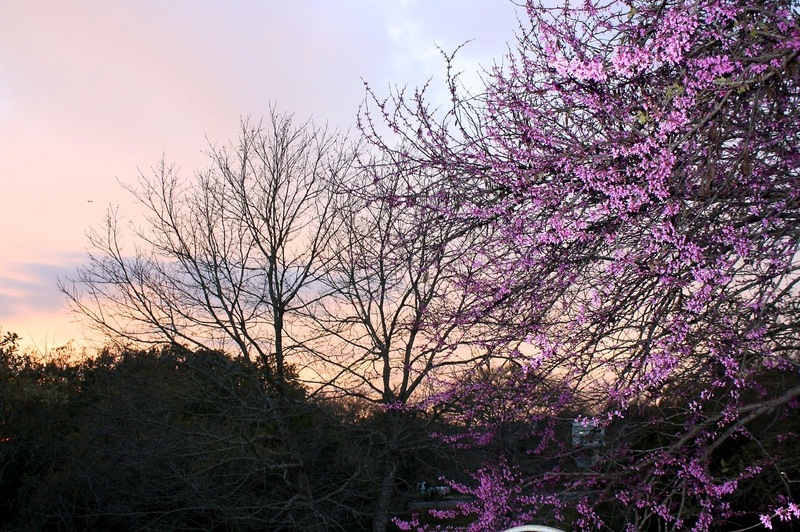 After I had taken my sewing break, Dan took this picture of the sun setting behind my favorite tree, the Texas redbud, which is in full bloom. I jotted down the description of the image as gratitude #333. I took a deep breath, and gave thanks for the opportunity to regain perspective. And for an incredible, supportive husband who encourages me to go sew when he knows I really need it. Funny that you mentioned the felt. I just made some shirts for my two with felt cupcakes. Very roughly handstitched though. 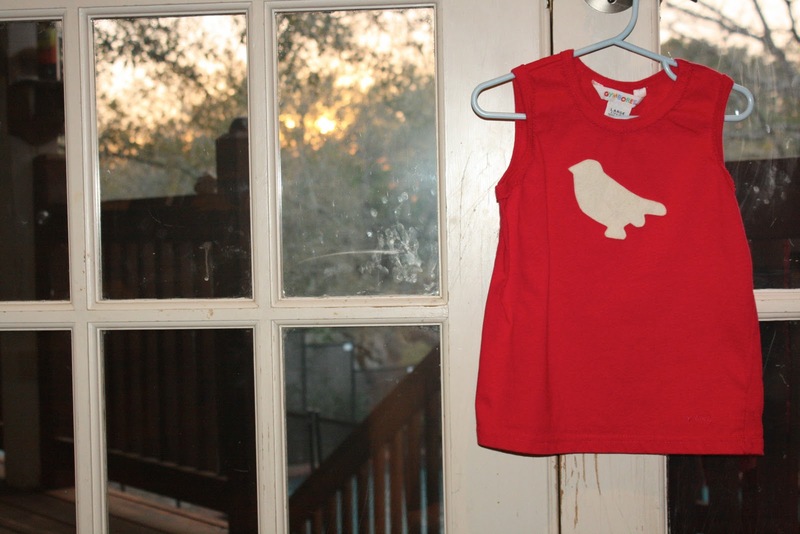 The girls love them and have requests for all kinds of things to add to clothing! The 30's are the best times. I enjoyed every second of mine. Tell Dan the cake is great. He's just such a sweet ole' boy, Rachel. You guys are just te neatest bunch. Glad your day was so lovely, just as you deserve! Love the idea of refreshing and making your own of those gently used clothing items! Hope missed naps was just a phase; a passing phase!! Sorry about the nap strike--hang in there, Mama!